UK PR agencies have experienced their most profitable year since the global economic downturn and a sharp drop in redundancies, but the industry still faces a testing time during 2013. The PRCA's annual consultancy Benchmarking Survey found a healthy increase in average pre-tax profits and income during 2012, along with a sharp fall in redundancies across the agency world. 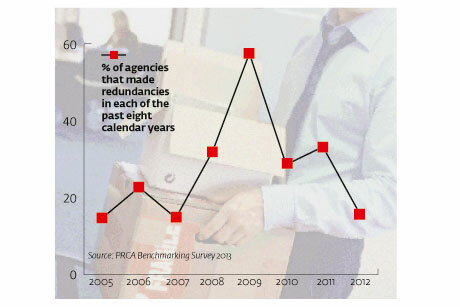 The PRCA figures, which encompass the calendar year 2012 and are derived from the responses of 169 agencies, found the number of consultancies reporting redundancies dropped from 33 per cent in 2011 to 18 per cent in 2012. Average profit margins across the surveyed agencies rose from 16 per cent to 17.7 per cent, while average pre-tax profit increased by 18 per cent to £506,000, after a one per cent drop in 2011. Finance specialist Esther Carder, who helped oversee the survey, claimed the agency sector is entering 'a new normal' after a long spell of uncertainty. Agency restructures triggered 52 per cent of last year's redundancies compared with 81 per cent during 2011. Additionally, the quarterly PRCA barometer for Q1 2013 found that 49 per cent of agency chiefs expected to increase headcount in Q2 and just six per cent expected to cut it. Continuing the positive trend, the average minimum monthly retainer rose to £3,510, up £310 on the previous year, while over-servicing levels fell by two percentage points to 20 per cent. However, a number of agency sources told PRWeek that market conditions appeared to have deteriorated during the early part of 2013. 'It feels like conditions have worsened quite drastically in 2013. From a commercial point of view, this year has been one of the most challenging I can remember,' the source said. Account executives top the 2012 pay rise league with average increase of nearly six per cent. Salary increases have risen above the rate of inflation for the first time in four years, according to the PRCA findings. The survey showed that during 2012, salaries rose 4.7 per cent - two percentage points above inflation - reversing the trend from 2009. Between 2009 and 2011 (inclusive), inflation rose faster than salaries, with the biggest gap being 0.9 per cent. In 2012 account executives enjoyed the biggest rise, at 5.8 per cent, while partners and those on agency boards had the lowest rise of 2.4 per cent. Those at account director and director level, meanwhile, saw salaries rise 4.5 per cent on average. What we are looking at is the new normal. There is more professional practice and there are more robust businesses now as a result of what has happened in recent years. On the plus side, the status and prestige of PR has grown during these times in the eyes of clients, but the challenge remains for that value to be translated financially. These figures represent a turning point for the industry. The recovery for PR is well and truly here. Even though we are not in the boom years of a decade ago,if you can prove your value, growth is back.